One of the largest and most efficient energy from waste plants in Europe; Runcorn will be capable of generating up to 70MW of electricity and up to 51 MW of heat. The facility will offer local authorities (including the Greater Manchester Waste Disposal Authority) and NW businesses a viable alternative to sending non-recyclable waste to landfill or exporting it for treatment in Europe. It will operate in conjunction with concerted efforts to ensure that customers are able to recycle as much as possible. Prior to use as fuel at the Runcorn EfW plant, waste will be passed through a pre-treatment process to remove materials for recycling either at a Viridor or authorised third party site. Commissioning of Phase1 of Runcorn EfW began in January and the ‘first burn’ using RDF signals the final stages of testing and commissioning before the site becomes fully operational. Much of the RDF for Runcorn will arrive by rail and the railhead delivery points have also been successfully tested. The facility will produce renewable electricity and heat which will be utilised by the neighbouring INEOS facility. 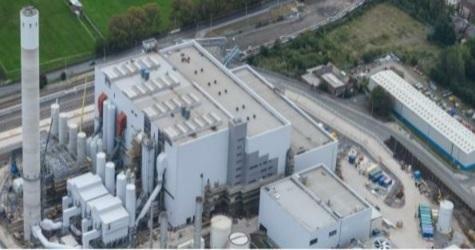 Runcorn Phase 2 is scheduled to accept RDF later this year with takeover of the entire facility expected in late 2014. The total project represents a £452 million investment, creating around 80 permanent jobs within the facility as well as having employed up to 1100 people during peak construction. Once fully operational the facility will process up to 850,000 tonnes of RDF each year. The facility will supply INEOS with up to 20% of its total energy needs, significantly cutting the company’s annual energy bill at its Runcorn site and improving its energy security by reducing its reliance on fossil fuels. Viridor Operations Director, Mark Burrows-Smith, commented; “This marks an important milestone in the commissioning process at Runcorn and in Viridor’s wider energy recovery investment programme.